Driving along Mumbai’s Eastern Express Highway towards Nashik, through the grime and bustle of a teeming megapolis, we turn off the road at Vikhroli into a startling haven of greenery. This is Godrej & Boyce’s 3,000 acre facility, which is touted as “Mumbai’s second lung”, the first being the Sanjay Gandhi National Park. The campus includes 1,400 acres of mangroves – India’s largest privately owned mangrove forest, we learn – which is conserved, with typical Godrej meticulousness, according to ISO 14001 standards. This is an industrial house bred in the old-school manufacturing values of the Mumbai club, but which has displayed unusual agility in creating high-technology skills as a builder of advanced weaponry. Since 1897, when it set up as a manufacturer of locks and safes, the Godrej Group has ridden the technology crest – building 1.7 million ballot boxes for India’s first general elections (1951), India’s first typewriter (1955), refrigerator (1958), forklift truck (1963) and a totally green refrigerator (2002). Branching out in 2014, the wholly owned Godrej Aerospace has designed and built the powerful Vikas engines that drive India’s workhorse rockets – the Polar Satellite Launch Vehicle (PSLV) and Geosynchronous Satellite Launch Vehicle (GSLV) – and sophisticated cryogenic engines for propelling those rockets outside the atmosphere. Last year, Godrej Aerospace delivered the 100th airframe it had manufactured for the Indo-Russian BrahMos cruise missile, reputedly the world’s most advanced. How did this maker of locks and safes become India’s most trusted manufacturer of rockets and missiles? It has been the single source for several products for the Indian Space Research Organisation (ISRO) and the Defence R&D Organisation (DRDO) for decades. A key reason has been its obsession with technology and engineering and a willingness to submit products to the most rigorous testing, essential for space and defence products. Godrej Aerospace business head, SM Vaidya, is only half joking when he recounts the apocryphal tale of how the firm’s safes were tested. In 1944, a freighter carrying 1,400 tonnes of explosives exploded in the Bombay Docks, killing about 1,300 people. The only item salvaged from that vessel was a Godrej safe, its contents intact. “We continue to outsource rigorous product testing,” says Vaidya, tongue firmly in cheek. In 1985, Godrej & Boyce – by then a reputed manufacturer of consumer products and petrochemical machinery with acknowledged capabilities in precision machining – was approached by ISRO for help in making satellite and rocket parts. Over the next four years, the firm manufactured assemblies for ISRO’s satellite launch vehicle (SLV) and augmented satellite launch vehicle (ASLV), and liquid-propellant motors with a three-tonne thrust for the DRDO’s Prithvi missile. In 1989, Godrej & Boyce got their breakthrough by winning an ISRO tender for manufacturing the second stage of the experimental PSLV – a quantum jump to building a motor with 75 tonnes of thrust, called the Vikas engine. 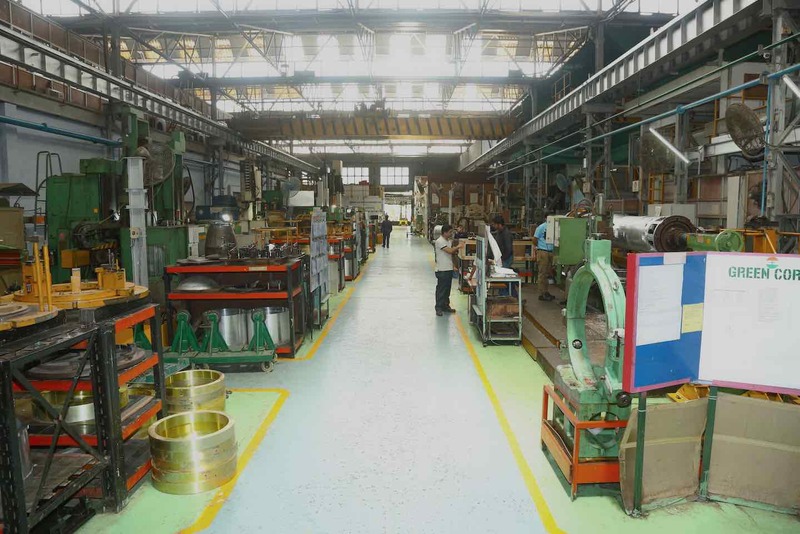 Since delivering the first Vikas engine for the PSLV in 1994, Godrej & Boyce and its consortium partner, Hyderabad-based Machine Tools Aids & Reconditioning, have built more than 120 Vikas engines. In 1993, with Russia denying India cryogenic engine technology, the Godrej consortium was chosen to develop an Indian cryogenic engine. This was the most challenging of engine projects, with only five countries – US, Russia, China, Japan and France – having successfully developed cryogenic engines. It took eleven gruelling years of development, with numerous setbacks, before a GSLV with a cryogenic stage was successfully launched in January 2014. With that success, there was no looking back. ISRO launched a programme to develop a new cryogenic engine, with 20 tonnes of thrust. The same year, Godrej also signed up to build a 200-tonne, semi-cryogenic engine that will be the world’s second largest booster. While the fully cryogenic engine uses liquid hydrogen as fuel and liquid oxygen as oxidiser (both at minus 260-270 degrees Celsius), the semi-cryogenic engine uses aviation-grade gasoline as fuel, making it cheaper and safer. And, with its credentials firmly established, Godrej & Boyce named the business unit that was building rockets and missiles Godrej Aerospace. Godrej Aerospace’s new-generation cryogenic and semi-cryogenic engines will play important roles in the Chandrayaan and Mangalyaan missions. A Godrej cryogenic engine was part of PSLV C37, which successfully launched a world-record 104 satellites in February 2017. And GSLV Mark III, also powered by a Godrej CE-20 cryogenic engine, has placed a four-tonne satellite in geosynchronous transfer orbit. Given Godrej & Boyce’s important role in the SLV and ASLV, it was inevitable that when the dynamic director of those projects, Dr APJ Abdul Kalam, moved to the DRDO, Godrej would become involved in Kalam’s new brainchild: the Integrated Guided Missile Development Programme (IGMDP). This laid out in 1983 a blueprint for developing five military missiles – Prithvi, Agni, Akash, Trishul and Nag. 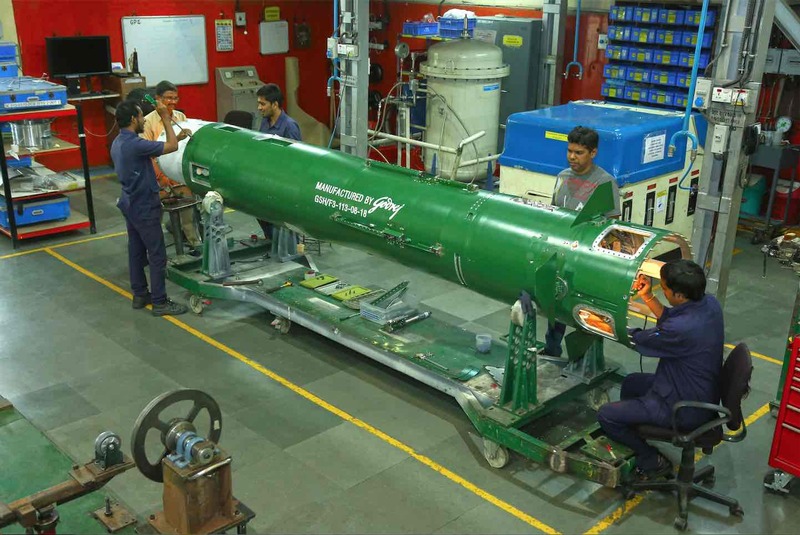 Godrej & Boyce was immediately involved in building the Prithvi, India’s first nuclear delivery vehicle that had a range of just 250 kilometres. But with the army less than happy with the Prithvi’s primitive avionics, that project was closed and the longer-range Agni missiles became the military’s ballistic missile of choice. However Godrej & Boyce were not involved in the Agni project, choosing instead to focus on the Indo-Russian BrahMos missile. Since 1999, Godrej Aerospace has come to dominate BrahMos production. It currently builds all the metallic assemblies, including 7,000 components amounting to 70 per cent of the missile. These include five of the missile’s 17 assemblies, including the airframe, nose cap, wings and fins, and is currently developing an indigenous booster – a solid-propellant engine that gives the BrahMos its initial thrust, accelerating it to Mach 2 to allow the propulsion ramjet to ignite. After delivering over 100 land-based and sea-based BrahMos missiles, Godrej Aerospace was selected to build the air-launched cruise missile (ALCM) as well. This has been a complex undertaking, with the weight of the air-launched BrahMos having been reduced by about 400 kg from the original two tonnes so that it can be carried on a Sukhoi-30MKI fighter. With the first such missile having been delivered last month, Godrej Aerospace has another 100 ALCMs on order. Besides the BrahMos, Godrej Aerospace is heavily involved in several surface-to-air missile (SAM) projects, including the long range, medium range, short range, quick reaction and extended range SAMs, which the DRDO is developing with Israeli firms Rafael and Israeli Aerospace Industries. There is also Godrej involvement in building indigenous Pinaka rockets, the Pralaya missile programme and developing a new, longer-range Pinaka II rocket. Kaustubh Shukla, chief operating officer for Godrej & Boyce's Industrial Products Group, says the firm is not aiming to become a “Strategic Partner” (SP) under the defence ministry’s new policy to develop private sector SPs as prime integrators of complex weapons platforms. He says the company is content with Tier-1 status, building the systems and assemblies that another SP firm would integrate into a full weapons system. Despite the intensity of Godrej Aerospace’s involvement in defence, its annual income is a mere Rs 300 crore, just 3 per cent of Godrej & Boyce’s annual turnover of about Rs 10,000 crore. But this hardly discourages Jamshyd Godrej. “We have pursued a role in defence to support the national endeavour and to successfully meet the challenge of realizing complex technologies and building systems that the country needs. In a way there is a higher order purpose than merely business turnover,” he says, echoing a family philosophy that goes back to Ardeshir Godrej’s role in the freedom struggle. With defence orders irregular, Godrej Aerospace has sought stability by expanding into the more stable building of assemblies for global civilian aerospace supply chains. There are long-term production contracts with Rolls-Royce, Boeing, General Electric, Pratt & Whitney, Honeywell, Eaton, Snecma (Safran) and GKN. As we leave, Vaidya informs us that Godrej Aerospace has successfully developed actuators for the Tejas fighter, a high-tech component that has been sourced so far from US company, Moog. No more than 73 Tejas aircraft will use Godrej actuators, but that seems to worry nobody. The achievement is apparently what matters – the hallmark of a high-technology company. Didn't know any of this. This is great work by Godrej. Thank you for such a fine article!!! That's y I follow u sir..always good to read about defence from u. After succesfully mastering over cryogenic technology Godrej should focus on acquiring low and high bypass turbofan and turboshaft technology so as to build engines for indigenous aeroplanes and helicopters both of military and civilian grade. Actually India needs four or major big private industries to immediately start research and development of aerospace technology so as give the country a deterrent edge over other top nations in future transport business and defence selfsufficiency. I am the user of the above product. Yes it's a long journey . G&B has extremely well. Kudos even Russian's have appreciated the high quality standards. The kind companies that are needed and should be rewarded by the government. What a fabulous story. I never knew that G&B had diversified so far. Thank you for the blog. You should also visit the Hyderabad based MTAR. A small company whose technocrat founder Ravindra Reddy is obsessed with precision engineering and has done outstanding work for Space & Nuclear programs as well as DRDO. GodrejCompanies achievements in India's aerospace should be more vigorously circulated. With good work culture and ethics, any company can succeed in Defense Technology. Hopefully, there are more of such companies in India, especially in the most critical field of Electronics manufacturing, some Indian companies in that field have become satisfied in remaining just a trading company. Kudos to G&B for their selfless and untiring contribution to the nation's defence without eyeing the bottom line! How did it happen??? Yes, it's mainly because of the vicinity to IIT Powai. Thank you for the article, I was employee of Godrej & Boyce in the Machine tools and Forklifts division I also handled steel castings and Stainless Steel fabrication. at that time Godrej used to make sheet matal working machines such as Guillitone Shears, Press Brakes and Presses. I was the first engineer to sell CNC LVD machine tools to Midhani, ECIL and HAL all in Hyderabad. Dr. Dattar was the head of stain steel fabrication division at that time Godrej supplied lot of petro chemical plant related equipment like Distilling columns Bubble cap trays etc. 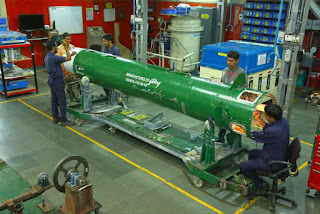 Dr. Abdul Kalam approached Seth NP Godrej and convinced him to supply Oxidizer and Fuel tanks all Stainless Steel fabrication for Prithvi and Agni missiles first generation in 1983. 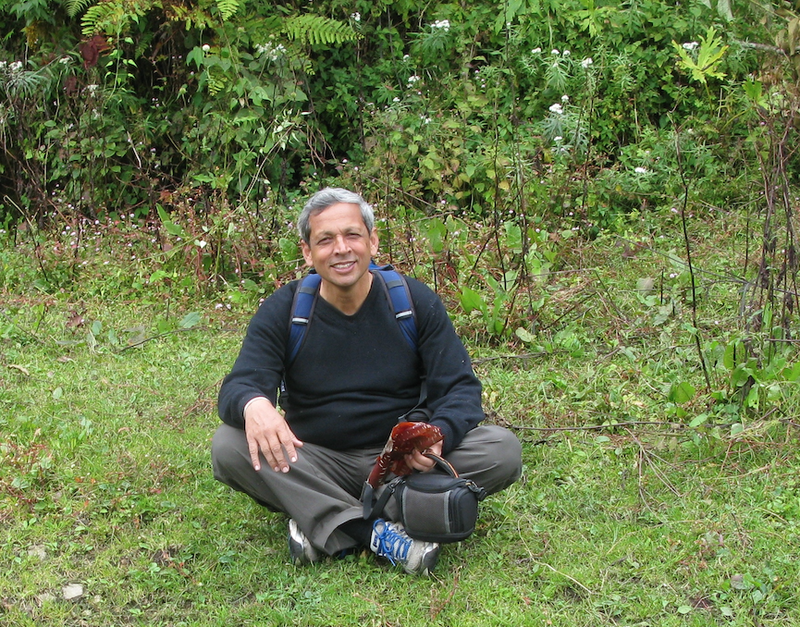 I left Godrej in 1987 and emigrated to US to work for GM. Thanks for bringing back memories. SS welding is very tricky and Godrej had a great tool room to make special dies and toolings for special purpose components. 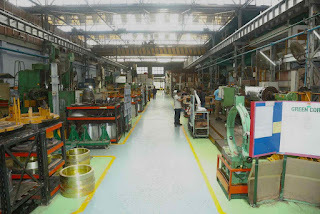 also Godrej was very good at reverse engineering most the mechanical presses were reverse engineered versions of Bliss Maxhine Tools mechanical presses ( based out Kalamazoo Michigan USA later bought out by China in the late 1990.